Fine dining remains a cherished Biltmore tradition. Our talented culinary staff, inspired by the Vanderbilt legacy of entertaining, creates wonderful menus for functions large or small, formal or casual. Students who complete one of our Extern Programs have a broad range of practical, resume-building experiences that might otherwise take years to accomplish. Both culinary and pastry externships are available. Participants rotate through restaurant settings ranging from casual high-volume to elegant fine dining; along the way, there’s a contemporary open-kitchen bistro and a restaurant that features an extensive buffet for lunch and hosts private catered events in the evenings. Externs are scheduled to rotate between restaurant locations about every six weeks. The program provides hands-on experience at most culinary stations and a one-on-one learning relationship with our chefs and culinary teams. 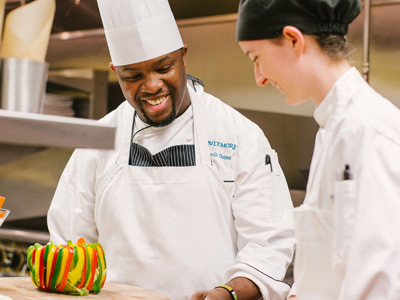 In addition to basic restaurant and station rotations, other externship components may include Pastry and Bread Production, Ice Carving, Meat Fabrication, Kitchen Garden and Vineyard Experiences, and Winery Production.